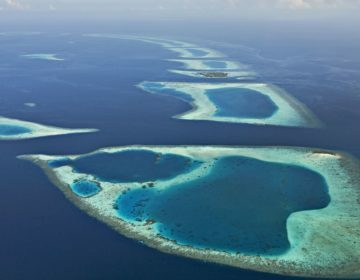 There is a four-kilometer reef to drift dive in this channel, and for convenience, it can be divided into three parts: the outside corner, the channel and inside. On the outside corner, the reef slopes slowly to 15 meters before falling away steeply to 30 meters. It then steps out and drops again to the shadowy depth below. The visibility is usually very good, and hammerhead sharks have been seen here. A large coral-encrusted anchor was lifted from the outside reef at 25 meters by Moofushi dive school in 1994. No other remains were found in the vicinity of the anchor. The anchor is on display at the resort. About 150 meters inside the channel is the best place to start with an incoming current. 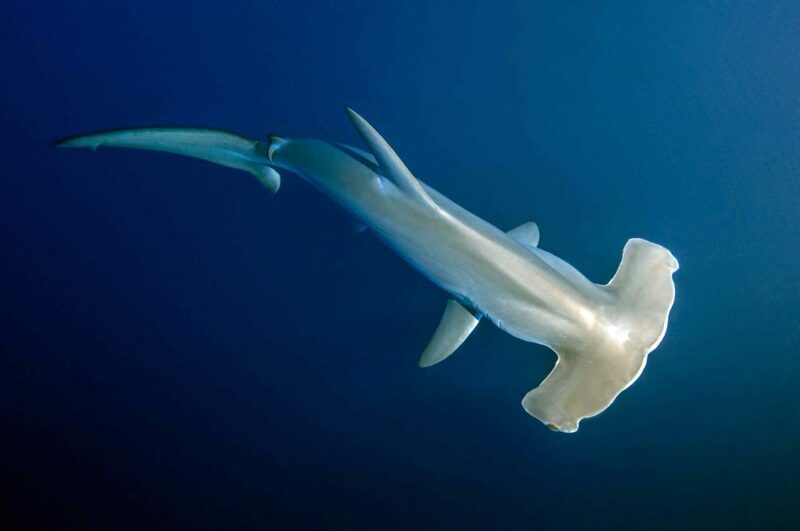 The visibility is usually very good, and hammerhead sharks have been seen here. There is a long overhang starting at 20 meters and rising to five meters here. Beautiful sea fans and whips cling to the bottom and walls of the protrusion and inside are emperor angelfish, sweetlips and squirrelfish while outside hover black snapper and midnight snapper. Further inside the channel, the reef again exposes its interiors with more crevices plunging from five meters back down to 20 meters. Further across the channel in 35 meters are several large outcrops of the reef where white-tips and grey reef sharks are found. There are also barracuda and big dog-toothed tuna. In the four-kilometer-wide Himendhoo Kandu is a large thila called Donkalo Thila. The best diving here is on the south side, which has an excellent wall with overhangs and plenty of fish life. 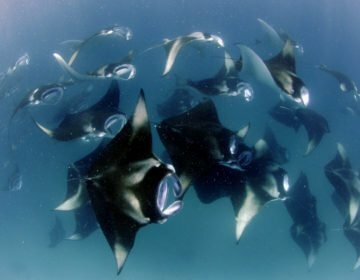 Mantas are regularly seen here during the north-east monsoon season, and whale sharks have often been sighted in Himendhoo Kandu. 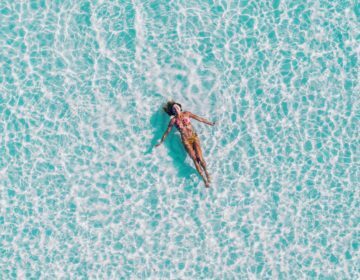 Click here to book a hotel on Himendhoo. 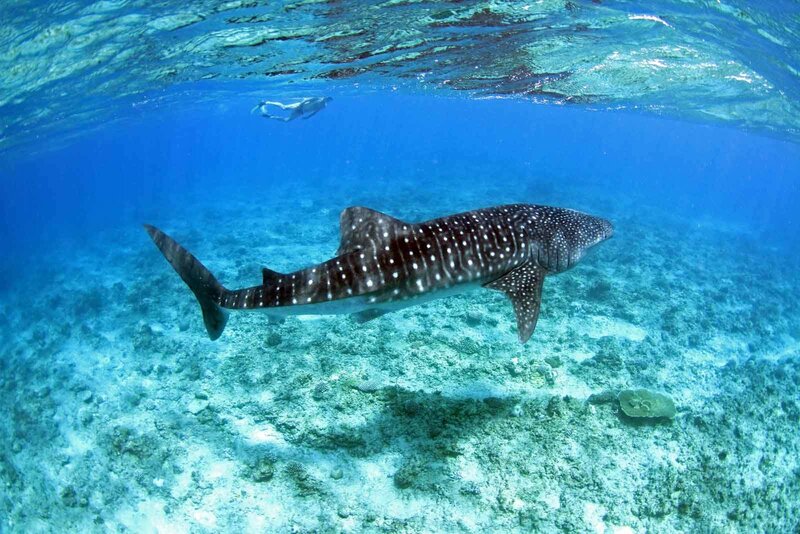 Whale sharks have often been sighted in Himendhoo Kandu during the north-east monsoon season. Divers are fortunate to have a house reef with an excellent wall dive virtually on their bungalow doorstep. The reef drops to 20 meters and has plenty of hard coral, large morays, octopus, stonefish, and lionfish. There are also stingrays on the bottom and occasionally eagle rays. Close by, only three minutes by dhoni from the resort is Fesdu Top. 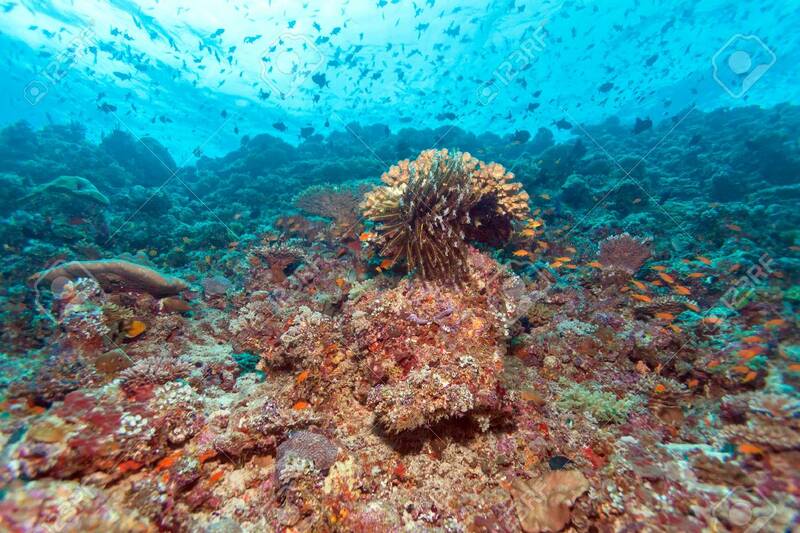 This is an exciting reef with the best diving at depths from 15 to 20 meters. There are many caves, some with lobsters. Fish life includes turtles, blue-striped snapper and lionfish. 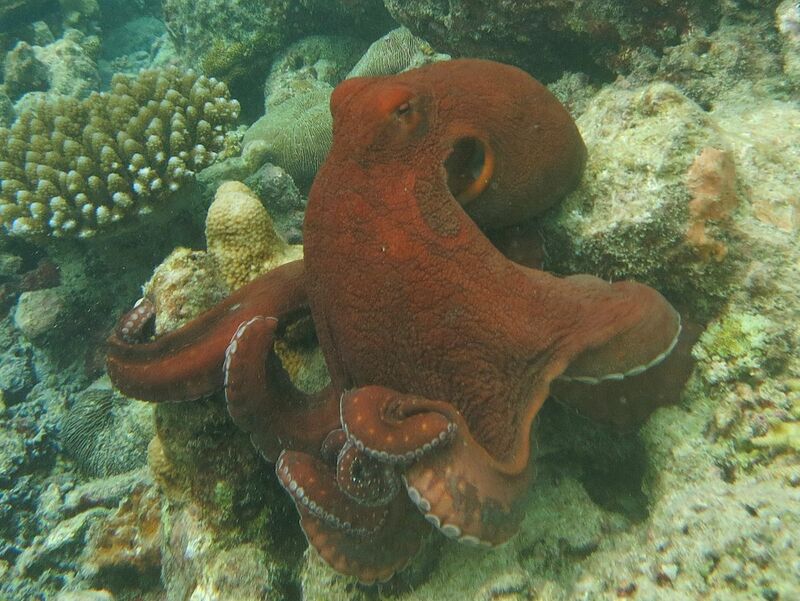 The reef drops to 20 meters and has plenty of hard coral, octopus (above), and lionfish. The wreck of this 30-meter coastal fishing trawler lies upright on the bottom at 29 meters with the bow facing almost north. The top of the wheelhouse is at 24 meters, and the propeller is at 27 meters. Coral is already well established, and a couple of good-sized black coral bushes are growing off the stern. Among the superstructure are moray eels and in the engine room are big grouper. The wreck lies at the end a small thila that is about 50 meters out from Viligilee Falhu. The top of the thila is at 12 meters and is usually visible from the surface. There is extensive soft and hard coral growth all over the thila and plenty of fish life, but there are few caves or interesting rock formations. Find the perfect hotel on Viligilee to experience this wreck dive by clicking here. There is extensive soft and hard coral growth all over the thila. On the northern side of Maalhoss in Maalholhu Uthuru Kandu is Maalhoss Thila, otherwise known as Bluecaves. The top of the thila is at about six meters and on the south side is a line of caves starting at around seven meters. The caves are shallower on the east side and descend one after the other down to about 27 meters on the western side. The ceilings are covered in soft coral in a mixture of colors, mostly white, but also blue and violet. The snowy colored soft coral is among the finest to be seen in Ari Atoll, and the decorated caves make a surreal backdrop for underwater photographers. Around the island of Feridhoo are any reefs and thilas are well worth exploring. A good start is at Berucolo Fahru where there is reasonable diving on the west side. Nearby on the west side is Berucolo Thila, starting at about four meters. Three kilometers east of Feridhoo is a reef with the best diving on the western corner. It has steep walls to 20 meters with some crevices and caves between 10 and 20 meters. There is one big cave with a swim-through on the corner at 10 meters. Stingrays are seen on the sandy floors of the caves, and some small morays are on the slopes. There are many butterflyfish including the teardrop butterflyfish. 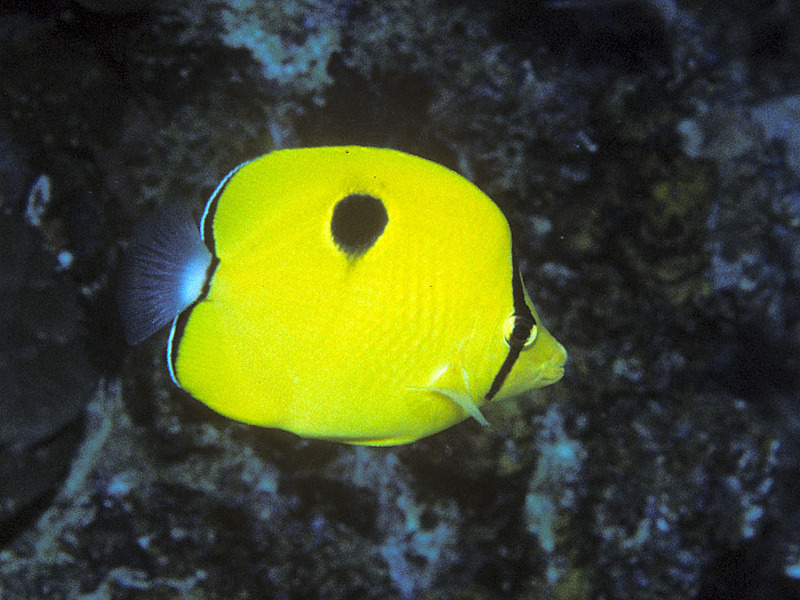 There are many butterflyfish including the teardrop butterflyfish (seen above). Eight kilometers east of Feridhoo is a long, effortless drift dive suited to beginner divers. There are some large deep caves with sandy floors between 10 and 20 meters allowing easy and controlled access. Inside are some small black and coral bushes with oyster shells. 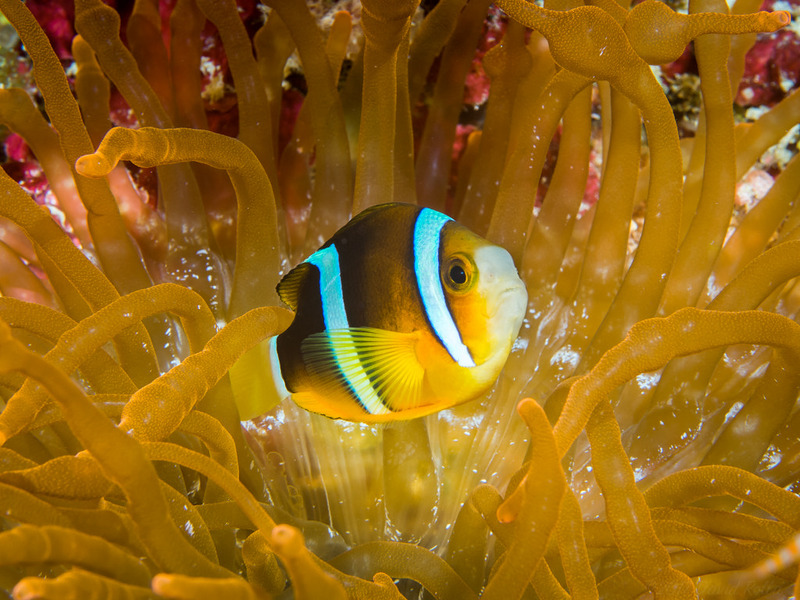 On the reef are large sea anemones with Clark’s anemonefish. There are also juvenile sweetlips, common lionfish, pufferfish and blue triggerfish. There is plenty of invertebrate life, including large sea-squirts in the shallower waters and banded shrimp. On the reef are large sea anemones with Clark’s anemonefish. On the north side of Madoo-Dhonogali is a 150-meter-long thila with the top at nine meters. There is a sandy bottom at 25 meters between the main reef and the thila, and on the outside, the depth drops to 30 meters. There are three peaks to this 150-meter-long thila that rises to six meters. The saddles between them are at depths around 12 meters. The east side drops to sand at 30 meters while the west side is shallower to 20 meters. There are caves at the south end sometimes with nurse sharks. There is fine coral, large lionfish, and mantas in March. 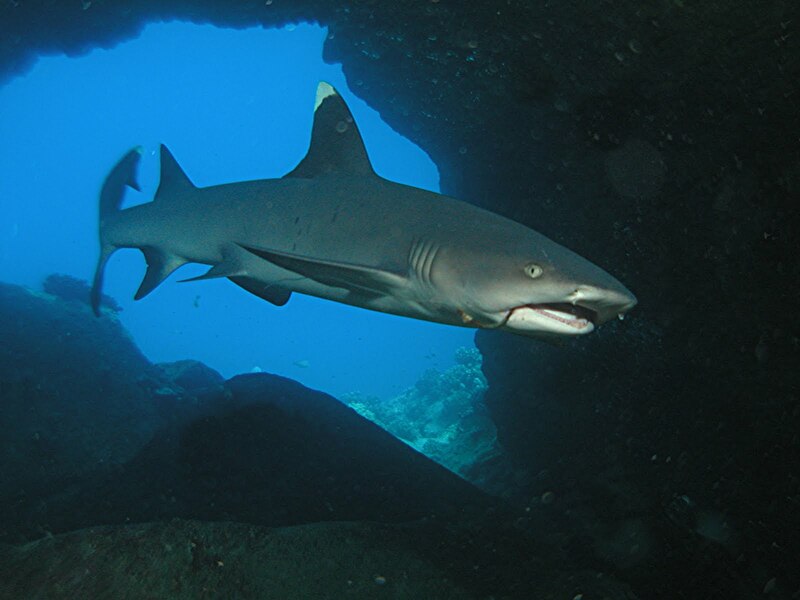 There are caves at the south end sometimes with nurse sharks. Next Article Where are the Maldives?